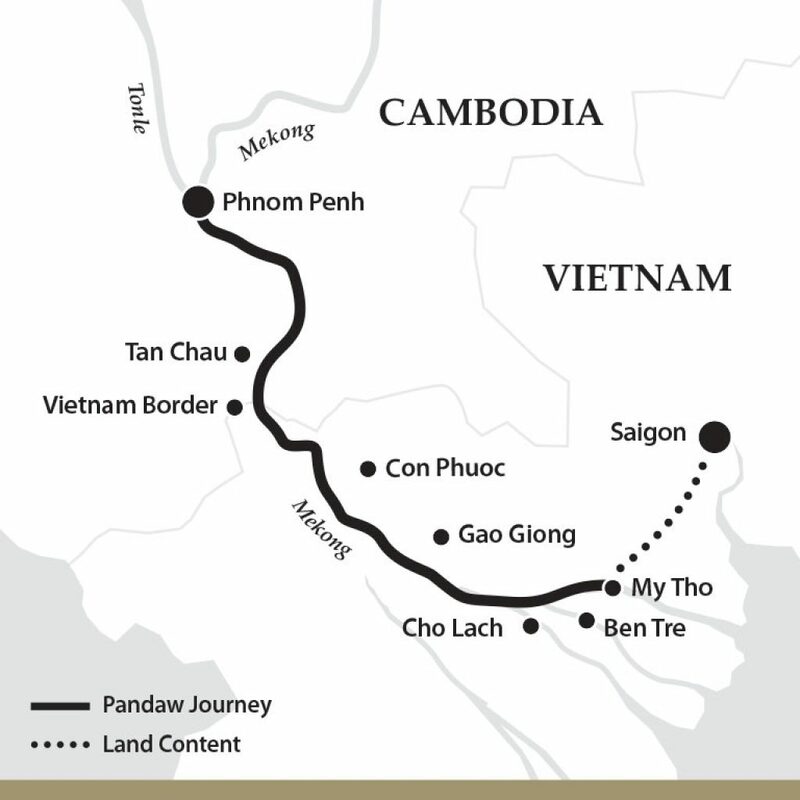 Phnom Penh – Saigon expedition starts from Phnom Penh. Embark the ship for lunch. The check-in time should be no later than 12.00 noon. We need your passport to process the immigration formalities for the border crossing. Rest of day at leisure. 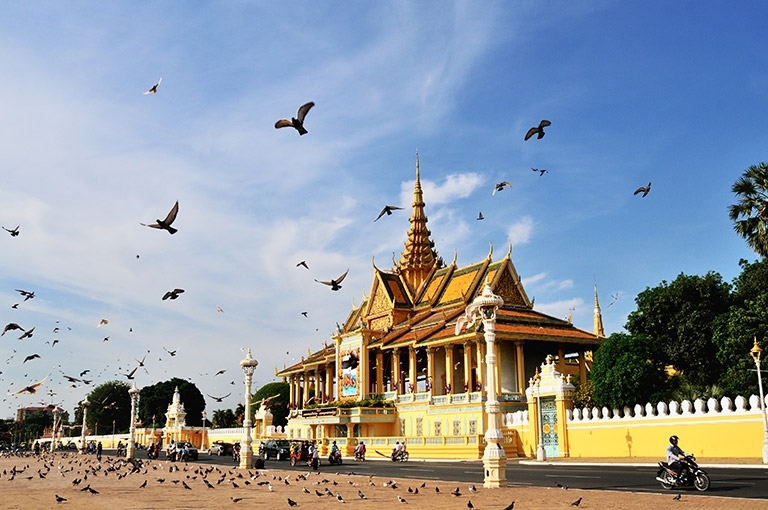 Overnight in Phnom Penh city port with its lively bars, restaurants and night life. Early sailing to the Vietnam border for formalities. During this stationary period there is an optional tour of the working ship and fruit carving classes on deck. Afternoon, explore the labyrinthine canal system around Tan Chau. Visiting a Taoist temple where the monks will read fortunes. Continue through local villages by Xi Loi stopping off to help locals tend their fields. Stopping off to visit a fish farm and earn merit by releasing fish back into the Mekong. In the morning sail up a small canal to moor off Con Phuoc Island. Explore the island by tuk-tuk seeing basket production and visiting a 100-year old Catholic Church and local woodworking artisans. After a short cruise downstream in the afternoon we take a short coach trip. We visit Gao Giong ‘green oasis’ with its bird sanctuary. Here a diverse selection of water birds and egrets that gather in the tens of thousands across the Duong Tharp Muoi or ‘Plain of Reeds’. Rowing boats traverse the canals to take us to see the principal nesting areas. After breakfast the ship moors off Cho Lach island for pot making and further glimpses of Delta life, agriculture. 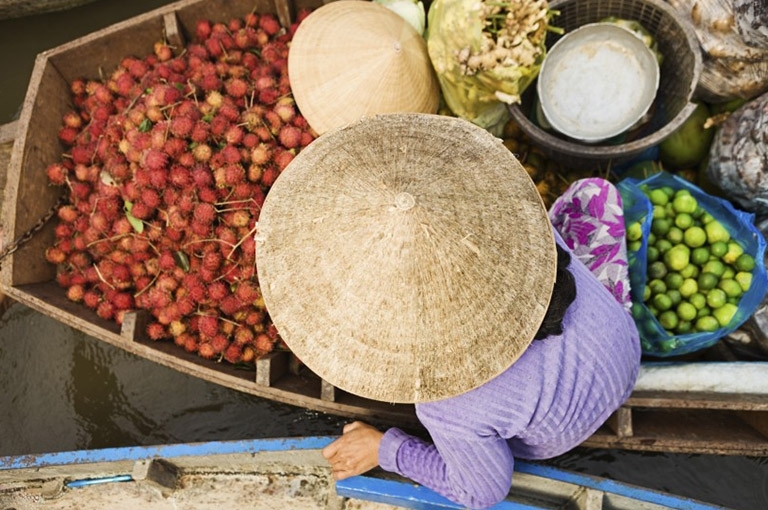 Local Viet hospitality including a culinary lesson in making traditional Banh Xeo. 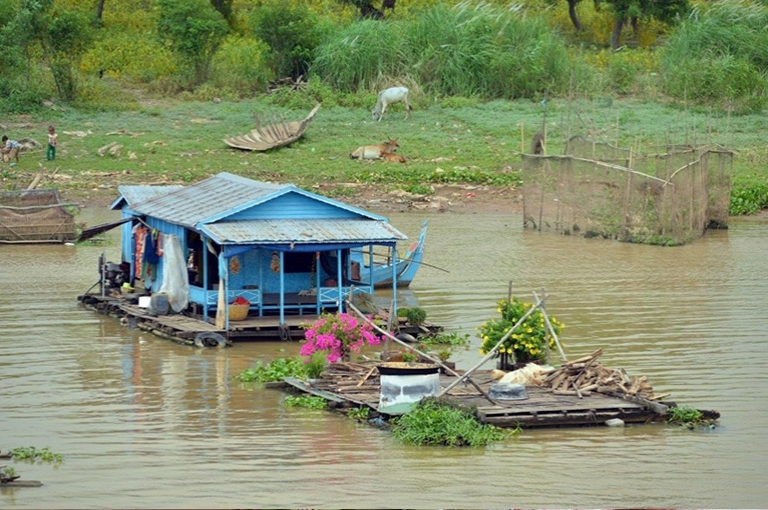 Upon return to the boat we take a cruise downstream to Ben Tre. 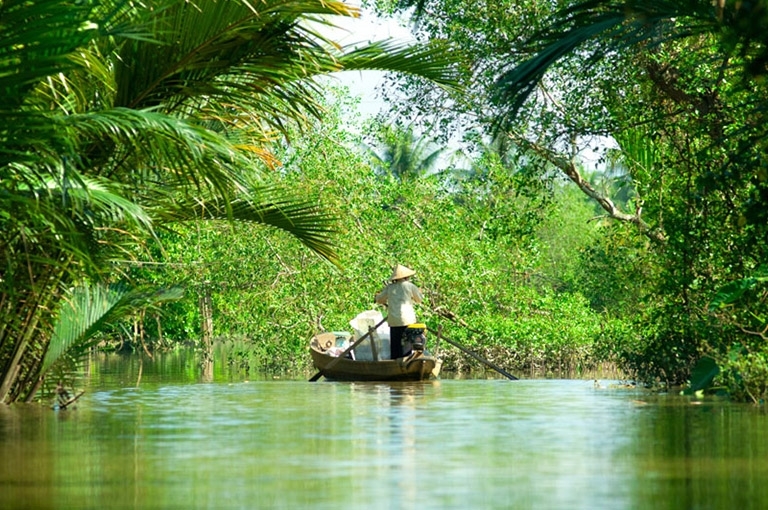 Where we travel by sampans through mangroves and bamboo groves to the fruit orchards of Ben Tre. In these local artisans are at work and are invite visitors into their homes for tea, fruit and honey products made from their own honey. This is an area rich in bird life and on our return journey we travel by horse cart through the lush countryside. 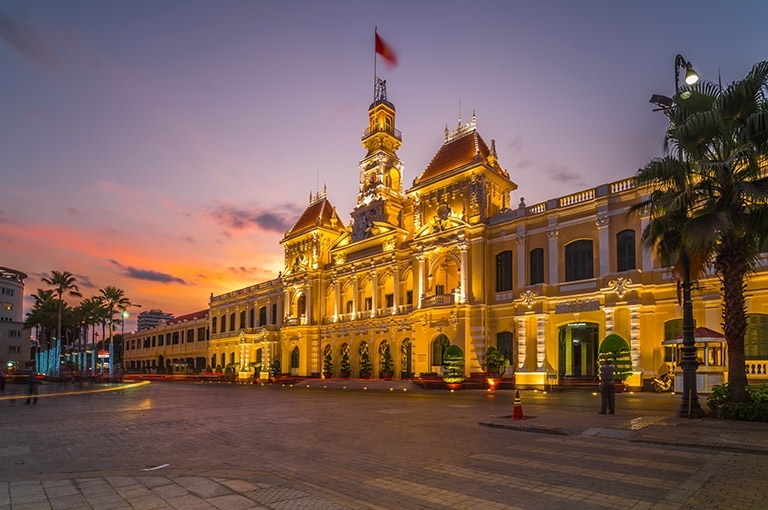 Disembark in the early morning for a coach transfer to the InterContinental Asiana Saigon Hotel, arriving late morning at around 09.30 – 10.00. Phnom Penh – Saigon expedition ends there. 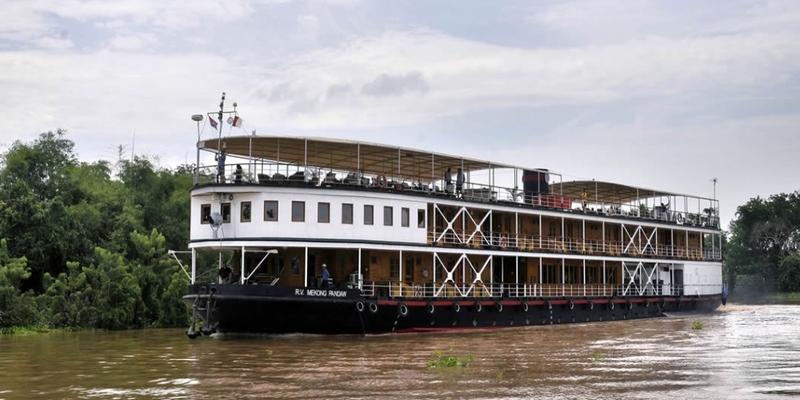 Upstream cruise itinerary Saigon – Phnom Penh. 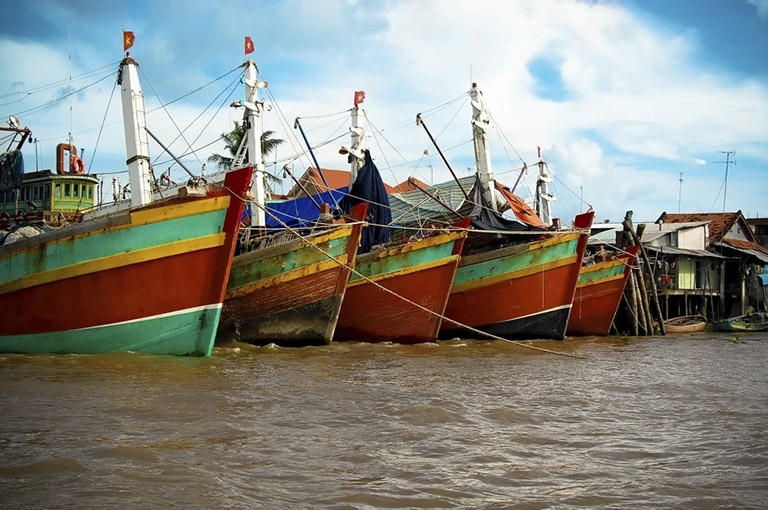 Transfers from meeting point in Saigon to ship or v.v. International flights, port dues (if levied), laundry, all visa costs, fuel surcharges (see terms and conditions), imported beverages such as wines, premium spirits and liqueurs, fancy soft drinks like Perrier, espressos and cappuccinos at bar and tips to tour guides, local guides, bus drivers, boat operators and cyclo drivers. 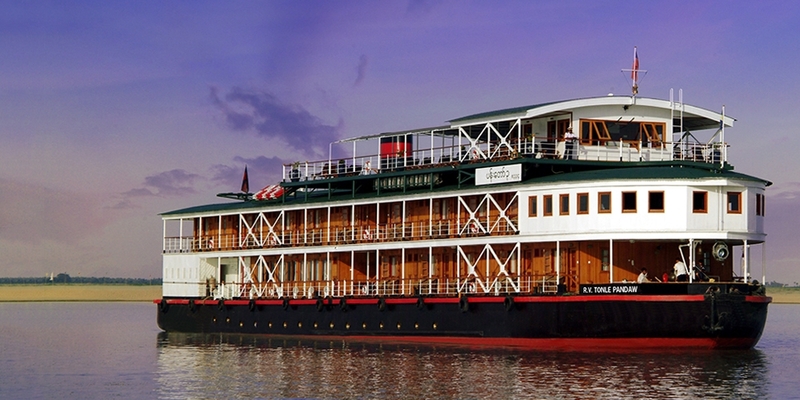 No transfers in Phnom Penh, ship docks in city center at Sisowath Quay. We accept Visa, MasterCard, JCB. We are a small group of people who absolutely love Mui Ne and actively working in tourism industry since 2008. 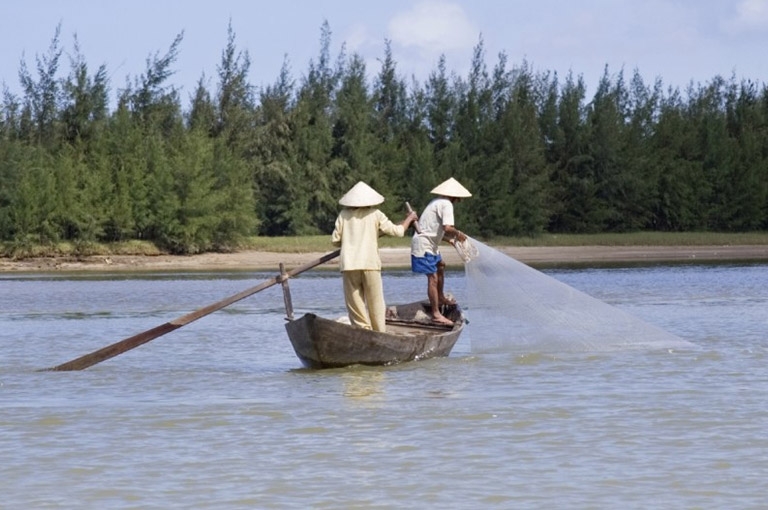 Liveinmuine.com (KY NGUYEN TRAVEL MEDIA COMPANY LIMITED) is Vietnam’s tour operator and full-service travel agency. We speak Vietnamese, English, Finnish, Estonian and Russian. Liveinmuine.com offers leading resorts, apartments, and villas for your vacation in Phan Thiet, Mui Ne. You can also book a quality airport transfer, sightseeing tours, visas through us, as a package, and save time and money. Our experienced travel consultants always here and can help you to customize your trip and make all the travel arrangements for a tailored vacation experience.